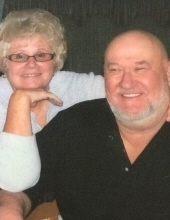 Thomas John Nagel of Punta Gorda, FL, formerly of Grand Ledge, MI, passed away January 8, 2019 at the age of 72. He was born November 4, 1946 in Grand Rapids, MI, son of Harold and Ruth (Colver) Nagel. Tom was retired from L&L Construction and a former employee of Waste Management. He enjoyed the last 8 years of retirement fulltime in Florida. He was an avid golfer; past member of the Grand Ledge Country Club and member of the Pecker Head Golf League. Tom was a hard worker and devoted family man. He will be greatly missed by those who love him. He is survived by his loving wife of 52 years, Karen and their children: John (Nancy), Scott, Tracy (Dennis) Higelmire, Amie (John) Norton; 11 grandchildren, 4 great grandchildren, sister Sharon (James) Strating, and was preceded in death by his parents and sister Carol Hamstra. To send flowers or a remembrance gift to the family of Thomas John Nagel, please visit our Tribute Store. 4444 W. Grand River Ave.
"Email Address" would like to share the life celebration of Thomas John Nagel. Click on the "link" to go to share a favorite memory or leave a condolence message for the family.